Editor’s Letter: What Is Ms. and What Is It Doing in New York? From the December 20, 1971 issue of New York Magazine. In the almost-four years of New York Magazine’s existence as an independent publication, we have witnessed a great upheaval in the publishing world. Magazines that were alive and strong at the time of our birth have since folded, victims to changing tastes, mailing costs, and the thousand other ills that print is heir to. Against all such trends, we have survived and continue to grow, as will other magazines that are designed to serve today’s readers. Partly out of the notion that success breeds success, and partly for reasons I’ll come to later on, we are now giving our support to another new magazine. The central 40 pages of this issue of New York—a double issue, covering the two-week period ’from now to the first of the year—consist of a preview issue of Ms., a national magazine edited totally by women, among them Gloria Steinem of our own staff. It is devoted to women—not as role players, but as full human beings. Why Ms. (which, by the way, is pronounced miz or miss, depending on the pronouncer)? Certainly the publishing world offers a staggering array of magazines aimed at a women’s readership, doing well for the most part. Invariably, however, these magazines see women in their traditional stereotypes as homemakers or clothes horses or mothers or hostesses. These days—as I don’t have to tell you if you’ve been following our own editorial content over the past few years—that is hardly the entire story. Gloria Steinem, a contributor to New York since our earliest days, is a spokeswoman and leader of the Women’s Movement, and it is inevitable that the combination of her deep personal convictions, her alliance with other women across the country, and her skill as a writer and editor should result in a magazine. We at New York owe Gloria a great deal. She helped enormously in getting our magazine started, and our staff members who have been with us since those uncertain days in early 1968 remember the forms her help took—from rewriting our direct mail pieces to promoting the magazine fiercely and turning out first-rate articles and columns under great pressure. Therefore, we must—out of love and gratitude, if for no other reasons (and there are others)—do what we can to help Gloria and her writing sisters get started on their own. Beyond that, we believe in the Women’s Movement. Until now, the Women’s Movement has lacked an effective national publication to give voice to its ideas. We have placed our own knowledge and experience at Gloria’s disposal to help shape such a magazine. Ms., like New York, will concern itself with one of the most significant movements of our time. Let me emphasize, however, that beyond playing godparent to Ms. for its first issue, we will have no further financial participation in the magazine. We want Ms. to be self-supporting and independent. With Elizabeth F. Harris in the role of publisher, Ms. is to be a magazine shaped by women. If we were to play the role of power-behind-the-scenes, that would only be a repetition of the traditional and already outmoded relationship between men and women. The business arrangement is this: New York is paying production costs of the first issue, the Ms. staff is writing and editing it, and we are dividing the proceeds 50-50. The Women’s Movement will have impact on our lives. Such a force obviously needs its own voice. After having worked with Gloria for years, I know that she is the right woman at the right time. She will, of course, remain as a Contributing Editor of New York, continuing to write for our pages when she wants to comment on the local political scene. There are more women than Gloria Steinem and Betty Harris involved. 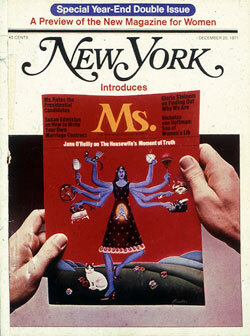 Some are on New York’s staff and worked to produce Ms. or to write for its first issue. Others have been working in the separate small office of Ms. and its female-controlled parent, Majority Enterprises. Naturally, all of us here in New York’s cramped East 32nd Street offices have been involved in one way or another, and it has been an exciting return for us to those days when our own Volume 1, Number 1 was taking shape. But special recognition should go to Bina Bernard, Joanne Edgar, Nina Finkelstein, Deborah Harkins, Betty Harris, Janet Lynch, Nancy Newhouse, Mary Peacock, Letty Pogrebin, Gloria Steinem, Joey Townsend, and Rochelle Udell. For all of them, let me wish Ms. longevity and strength.